The Hebrew date of Art’s Bar Mitzvah service was the 28th of the month Tishrei, which, consequently, is also this weekend. Happy anniversary of your Bar Mitzvah, Art! You are now a man. And then some. The portion of the Torah that is read on this date is the book of Noah. Did Arthur identify with Noah and his underdog qualities, riding out a storm until he and his vessel reached safety? Art would say in his later years, “I’m an atheist, thank god!” But at one point, his Jewishness was fundamental to his life. His father, Samuel, was a learned man in the Jewish texts, and Art’s sister remembered that at Samuel’s funeral, even the rabbi honored him with this praise. When they moved to New York, Samuel got a job as a “shamas,” a caretaker for a synagogue. Art seemed to have had a religious crisis after his father, a man of the Book, suffered a horrific accident. But more on Samuel Babitsky at a later date. 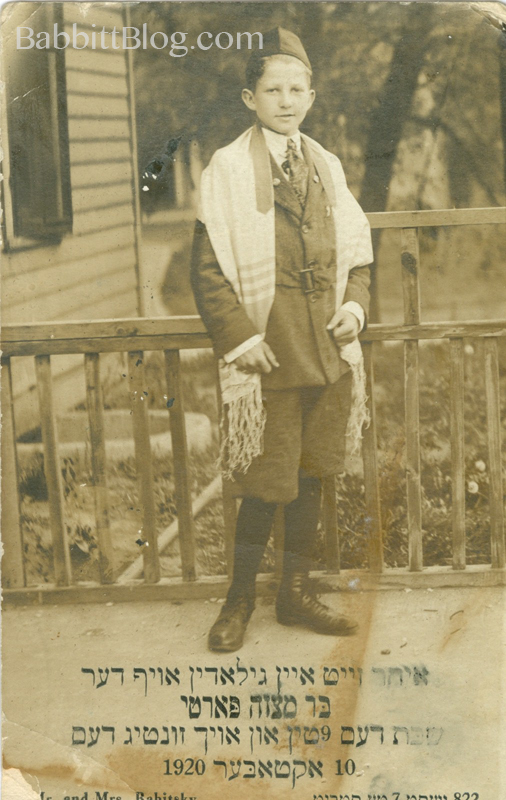 This entry was posted in 1907-1924: Sioux City Kid, Genealogy, Photography and tagged 1920s, Bar Mitzvah, Hebrew, old photographs, Sioux City, Yiddish. Bookmark the permalink.